संसारको बिभिन्न भू-भागमा छरपष्टित समस्त प्रवासी नेपाली दाजुभाइ तथा दिदीबहिनीहरु !! तपाईंहरुको दैनिक जीबनयात्रा प्रति स-कुशलताको कामना सहित माउण्ट एभरेष्ट स्पोर्टिङ्ग क्लव, काठमाण्डौ-कुवेतको सैद्दान्तिक एवं नीतिगत कार्यशैली तथा उद्देश्य ’bout सार्वजनिक गर्दछौं !! Thanks all of the staff and member of mount everest sporting club kathmandu kuwait for starting kuwaitnepal.com for online daily news. I read all news here and I want to give special thanks to Jay Ale for his dedication great written and all the team member of mount everest and kuwaitnepal you done grate work. WOW KASTO MITHO LEKHEKO I LIKE IT VERY MUCH GYUS ALL THE BEST TO YOU. Namaste sabai sadase haru lai bides ma bhayera pani jun kam tapai haru le nepali haru ko lagi garnu bhayeko chha tyo kuwait ka nepali haru sabai lai thaha chha. ma dherai khusi chhu and yesko sadasyata lina ke garnu parchha. All The best to the entire committee of Mount Everest Sporting Club, I really impressed in your club motto what a great view. dear committee member, i really appreciate to your effort, what is mount everest we know all. thanks for the information. above word is very appreciable for all the players. hi very nice and excellent vision and easy to understand of explanation you did mount everest sporting club. i would like to give a heartfelt thanks to all the entire committee of its organization. keep it up and happy new year 2068. I really liked reading your motto. Thank you very much MESC entire committee. keep it up. this article is really nice great persons are involve in mount everest sporting club. congratulation and thanks to all mount everest sporting club team members for your thinks to nepali people kuwait. kuwait ma chyau mumre sari sastha haru khuli raheko abasthama mount everest sporting club le afno karyashili naya dhanga bata change garera agadi badhne sallah dina chahanchhu. yo club ko introduction and motto padhda malai dherai khusi lagyo. naya karya samitilai hardik badhai tatha shubhakamana dina chahanchhu. kuwait bata chhutti jada nepal ma double saram paper banaunu parne bhanne news haru aai raheko abasthama nepal embassy sanga satya kura bujhera janakari garauna club le bhumika khelnu parne dekhinchha. kinaki yeha embassy le je bhane pani nepal ka karmachari harule embassy lai yek paisa ma pani gandainan yo maile pani bhogera ayeko chhu. yesma tapai haruko club pahila dekhi nei nepali haruko khatir laddai ayeko itihas bhayekole jasari pani bhujhera kuwait ka pidit nepali haru lai janakari garaunu huna anurodh gardachhu. very nice job please keep continue. dherai khusi lagyo club ko bichar padhera. Fantastic content and what a great ambition mount everest sporting club kathmandu nepal, kuwait. hoping that you will do more better and best for nepalese lives in kuwait and facing the problems. i am with you. Yo Site dherai ramro chha. malai nikai ramro lagyo sada saphaltako kamana gardachhu. This is great job club have done. please thank you and keep it up. I like this site. can you please let me know the procedure to join this organization ????? Thank you for your interest and sorry for delay in response. MESC ko Sadasyata ko lagi kuwaitnepal.com ko left sidebar ma “Faramharu” bhanne Column chha tesma “MESC Sadasyata Faram” bhanera Membership Form link garera rakhiyeko chha. Tesailai print gari fill-up garera Club Sachib Indra Bhusal lai Mob. No. 65748862 ma Samparka garnu huna anurodh garin6a. There are some important points in this page but I don’t know if I see all of them center to my heart. There is some much valuable points written-up but I wanrt to hold the opinion, if you gyus also are the same minded mentally whatever pointing out here in this articles then cheerssss guys go ahead God is great. Thanks and I want a lot morr!!! malai khuusi lageo kuwait ma.nepal.mbc ko.bare ma.padda. nicely explain but you should edit recent club acvities also. 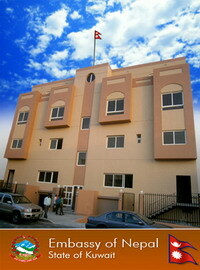 club is the one leading organization in Kuwait. great job club we are with you. mesc ko new elected committee le ajha ramro kam garna sakos bhanne kamana gardachu. Best of Luck to entire team of Mount Everest Sporting Club. KEEP IT UP YOUR SPRIT. valid registration मार्फत classified advertisement प्रकासित तथा email messaging and प्रतिकियाको पनि व्यवस्था गर्दा अझैँ राम्रो हुने थियो!! !